In many ways how we spend our weekends defines the Mondays. If you had a fruitful weekend with people you love and things you enjoy you definitely will start the week on a better note. Or Monday morning blues hit real bad. We had an wonderful weekend this time. The weather was pretty perfect and we unanimously decided that sitting at home would be a sin. though I was not very well during the last part of the past week still when sun shines I cant stay home. Sunday saw us walking on a new road to some very lesser known part of this city called Nihon Minka-en or Open air folk house museum. The place is situated in a beautiful hilly surrounding and small picturesque city. Here History lies in the form of Traditional Japanese farm houses complete with the furniture and the surrounding. These houses dates back to different times and have been relocated from different regions. the variety of technique and style varied from time to time and from region to region depending on the technology available at that point of time or the suitability to various natural surroundings. It was like a time warp. you enter one house and time stand still. You can almost see the women preparing the meal for their men coming back from the farm, their face warm and glowing in the late afternoon sun, or the cheerful loud voices of the horse traders entering the inn and ordering warm sake to relax and rejoice, or the cackle of the newborn and the whole family gather around her and the wood pit, sharing the warmth and enjoying quality family time. The old furnitures, original decor and the stories about each house written at the entrance almost transported us to that era. We loved every moment of it. thanks to the materialistic world the place was unusually less crowded and quiet. the only downside was the fact that half of the houses were under some restoration work so we could not see all of them. We plan to visit it once again (as they have provided us a free pass) once the work gets complete. Back to today's recipe which is nothing but a simple old style Cabbage curry, called Bandhakopi'r Ghanto or Torkari in Bengal. It's purely satwik (no onion or garlic) and utterly comforting. just the kind of dish that will make you happy after a long travel or a hectic day. First thing first wash, peel and cut the potatoes in cubes, keep aside. Mix ginger paste, cumin-coriander powder, chili and turmeric powder in 1/4 cup water. keep aside. Finely shred the cabbage and place in a big bowlful of water. Here I must mention that shredding the cabbage is an art and my mother has done her masters in it. She shreds it so fine that it almost resembles a fine twain. Am no where near her but I share her belief that shredding the cabbage real fine does add to the taste. Heat the oil in a big pan or Kadhai. I keep saying big as though the cabbage shrinks when it gets cooked but in the beginning you need much space to stir it. Once the oil is hot add the cumin seeds and slit green chilies. once they start to splutter add the potato cubes and a pinch of salt. cook on medium till they turn light golden. add in the mixed spices and salt. stir and cook till you see oil separating at the sides. add the tomato cut in quarters and mix everything well. After 4-5 minutes once the tomato is saucy and the raw smell is gone drain and add the shredded cabbage. Stir to combine well. cover and let it cook on medium flame for 7-8 minutes. Sometimes the cabbages are very fresh and leaves a lot of water. In that case don't cover the pot and just cook up the moisture by stirring at regular interval. open the lid, mix in the peas and again let it cook for 5-7 more minutes or till the cabbage is cooked (not crunchy but not mushy either) and the dish is almost dry. Adjust the seasoning by adding sugar and salt if required. Finally sprinkle the garam masala powder and the ghee. serve hot with steamed rice and any kind of Dal (Lentil dish). You can make many variations of this dish. You can replace peas with soaked black gram (Kala chana) or skip any addition rather top the dish with crispy fried and crumbled bori (sun dried lentil drops) to enjoy more texture. To make it non-veg you can always add tiny shrimps or fried fish head. but thats a different recipe altogether. Which I will prefer to share some other day. cabbage recipe, cabbage preparations, Indian cabbage curry, Indian style dry cabbage recipe, cabbage curry recipe, bengali cabbage recipes, cabbage and peas, cabbage and tomato stir fry, light cabbage dish, bandhakopir ghanto, niramish bandhakopi, koraishunti die bandhakopir torkari, how to prepare bengali style cabbage. 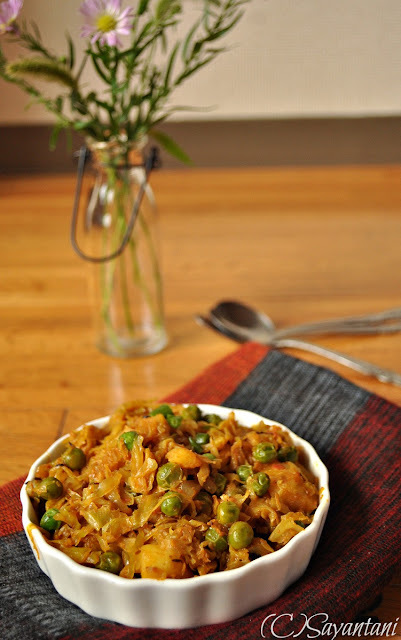 dry cabbage recipe, simple cabbage stir fry, pattagobi ki sabzi, pattagobhi curry, bandgobi shukhi sabji. you know, this curry is one of the typical side dish for south Indian banana leaf meal. only thing, we don't add sugar. Looks wonderful. Ei niramish bandhakopir torkari r garom bhat....Asadharon baniyecho. Looks delicious and fingerlicking good. Love this torkari. As a matter of fact, I cooked some this passed weekend. Very new to your blog and love the photos. Do you live in Japan? 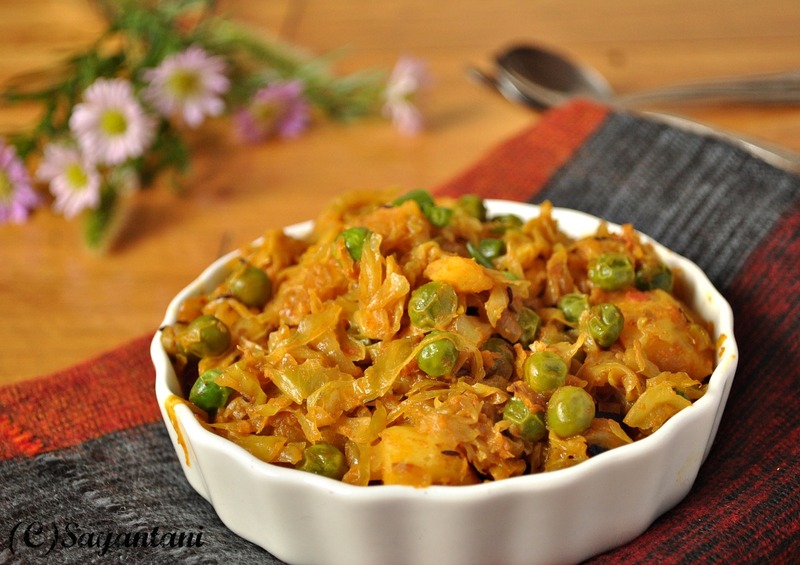 delicious and awesome cabbage curry. Delicious curry, we make it more often however with less sugar. Missing those Japanese museum visits. Amio same process e Bandhakopir torkari banai. Eta gorom bhat diye khete khub bhalo lage. aae simple tarkari khete khoob bhalo lage garam garam luchir sathe. Bhebechilam aae bandha kopir recipe ta post korbo...akhon tak...pore... na holey soman soman hoye jabe. kamon choleche life okhane...mone hocche enjoy korcho family-r sathe. Delicious!! I make this ginger flavored vegetable a lot but we are getting awful cabbages for last couple of months!! 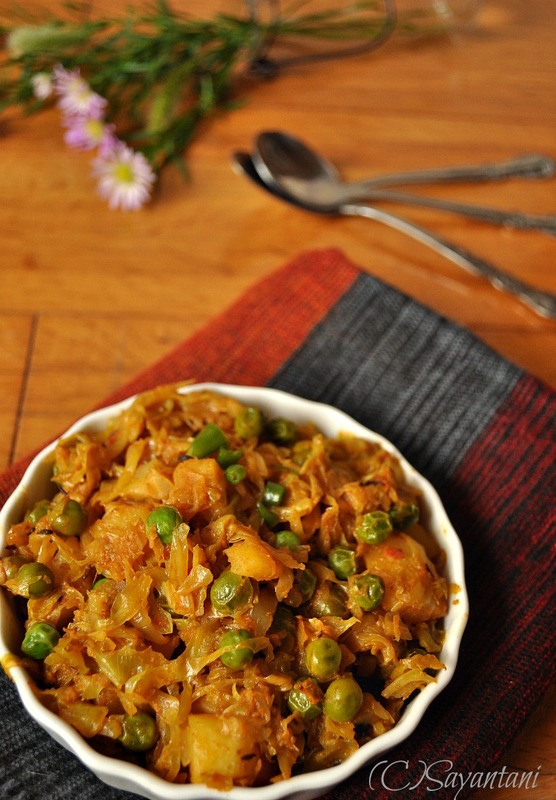 there are so many regional variations of simple cabbage currys and i love every one of them - bookmarking this to try next! Am quite a neophyte... Can you tell me the size of the band gobi either by weight... or by diameter... or how many cups of shredded gobi please? I love cooking your recipes. @Aseem, it would be 6-7 cups finely shredded.